Birmingham City and Aston Villa have each been fined £5,000 by the Football Association for failing to control players in their Second City derby. 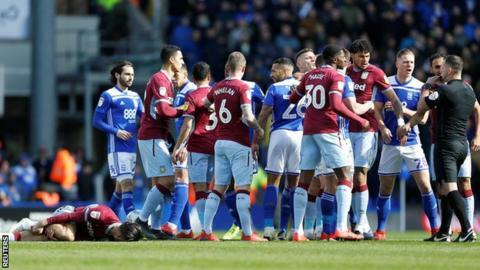 The Championship clubs were charged over a melee in the fifth minute after a foul on Villa captain Jack Grealish by Blues midfielder Maikel Kieftenbeld. Blues are facing a separate charge after Grealish was attacked on the pitch by a fan five minutes later. Villa won the game on 10 March 1-0, with Grealish scoring the only goal. Both clubs accepted the charge. Dutchman Kieftenbeld was booked for his late challenge, which set the tone for an ill-tempered game at St Andrew's. Grealish was subsequently attacked by Blues supporter Paul Mitchell, who ran on to the pitch and struck the Villa midfielder from behind in the side of the head. Mitchell, of Rubery, Worcestershire, was jailed for 14 weeks on 11 March after admitting assault and encroachment on to the pitch. He was also ordered to pay £350 in fines and costs and banned from attending any football matches in the UK for 10 years. Birmingham, who banned Mitchell from St Andrew's for life, were charged by the FA with failing to control their spectators and they have until 22 March to respond to that charge.